What an amazing press conference aside from all the questions remaining to be answered. 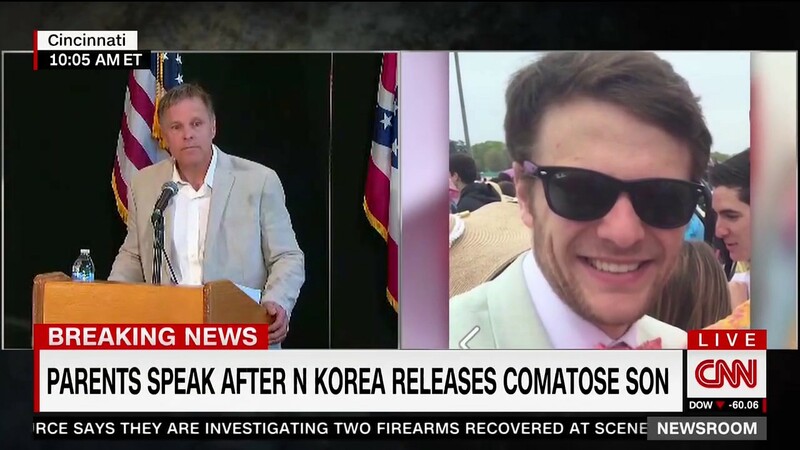 Fred Warmbier spoke about his son’s return back to the United States after being sentenced to 15 years of hard labor in North Korea for stealing a banner off the wall in the hotel he was staying. His name is Otto and it’s been 18 months since his tearful cry for mercy that day he was sentenced and sent to prison. Information received upon learning of his release was that Otto has been in a coma for most of the time he has been serving his sentence in N. Korea. The cause of the coma is unclear as of yet and North Korea is blaming a sleeping pill that he took, however his father is refusing to buy it and has blasted them in his heartache for the treatment that his son had to endure while over there. To be honest, this is a part that makes me think of a possible blessing of divine intervention… he was sentenced to hard labor, yet was in a coma most of the time he was there. That means, there was no hard labor being dealt with, that this young man would have definitely suffered even more so had it not been for the coma. If nothing comes back after being checked up and he’s healthy as can be, well I’d call it a gift from the heavens that he was in a coma most pf his time there. Otto’s father praised his son as being a “sweet, loving, kind person,” who is also brilliant. But the part that everyone is talking about now is when he explained in as much detail as he could the difference between how Obama handled his family’s tragedy and how Trump handled it. That difference…is everything. “They have our thanks for bringing Otto home,” he said. He detailed how the Obama administration advised the family not to do anything, to keep a low profile, not go on T.V. or do anything that could antagonize the North Koreans. Incredibly, they were even told not to put up any yellow ribbons for their son. His use of the term ‘strategic patience’ mimicked the words of Vice President Mike Pence who had announced that the period of ‘strategic patience’ (under Obama) with North Korea’s misdeeds was over. He was asked if he thought that the Obama administration could have done more to help his son. “The question was, do I think the past administration could have done more? I think the results speak for themselves,” Warmbier said. As we all are painfully aware, the “don’t do anything to antagonize” was how Obama handled most all the situations that called on him to step up and be a hero for Americans. There are several Americans suffering through their imprisonment overseas that Obama did nothing to reach out to. Barely even an acknowledgement to their existence. All while releasing dozens of prisoners held up at Guantanamo Bay and prisons around the nation. God bless President Trump. He didn’t do this for the attention, but he sure deserves it. Especially with all the CRAP being flung at him left or right for fake news that fake people choose to believe in and act on. Sending prayers out to those that are still locked up overseas, may they be released soon and brought back home where they belong.